44 It is hard to see the beak in the photo but you say it is the size of a blackbird and eats fruit so I would guess it is a juvenile blackbird, Abigail. They have a brown body and pale streaks on the back like those in your photo. 44 Having re-read you description and expanded the photo on an iPad I feel this may be a Song Thrush, Abigail. 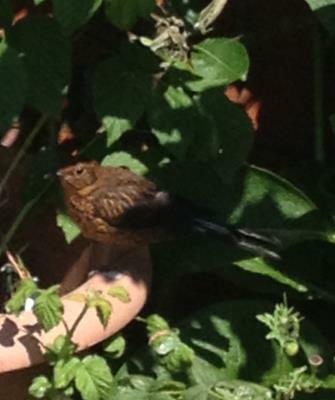 Slightly smaller than a blackbird, lighter brown than a female Blackbird but a speckled chest and a fruit eater. It is a little hard to be certain with part of the bird in the shade. Sorry.